How do you delete a list you no longer use? Hate Walmart. Takes space & I want it gone. Sharon, just go to All lists tab, long-tap the list you don’t need and choose Delete. You can also add any lists you like under All lists tab. Hi, loving the app so far. I was a Grocery-Tracker user for years, but it just won’t work with my phone anymore. This app has all the features I need. I would like to transfer my items with their prices to this app (manually) so they will be available to add to a shopping list later…should I enter them in the Pick List or in Groceries? And, can I enter items already on hand directly into pantry? Thanks for a great product! Katheryn, thanks for your feedback. There are all different ways to enter data in Mighty Grocery. From what I am hearing, I’d recommend entering data in Pick list (Menu > Settings > Pick list) or in Favorites. You may also consider using List-specific favorites if you’d like your products to use per-store prices. Then, you’ll add items to your shopping lists. 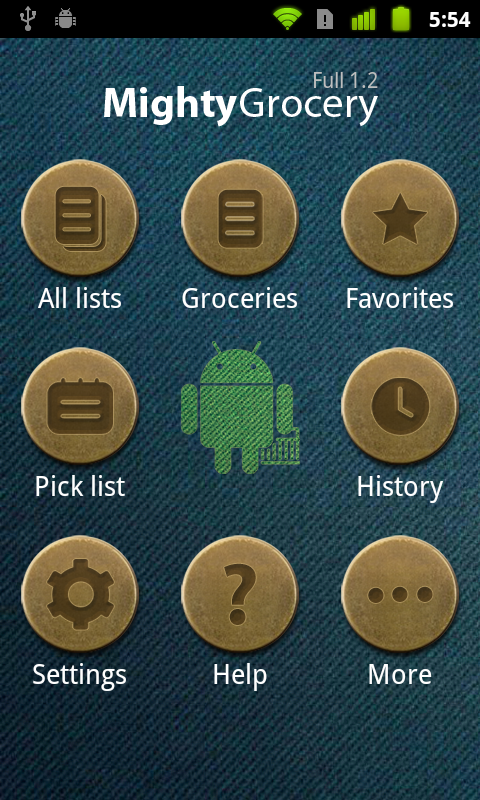 After shopping trip, you Pantry can be updated automatically. You can start entering data in Pantry, but this will require one extra step to enter product price. Just give it a try on a couple of products and see which approach suits better for you. Kathy, don’t worry about assignment of items to store in Pick list. The list you select on top is just destination list where you items will be added if you tap them in the Pick list. So you should be fine just adding items in Pick list as you do now. I am new to this. I am not able to access rwxipes. It says full on my screen but empty when I tap it. I also do not see any thing that looks like the instructional video. NNo picture’s no stores. Help. I just purchased the full version. I see it didn’t uninstall the free version automatically. I see my lists in the full version. Can I uninstall the free version with out losing any of my data? Is there a way to back up my data to make sure I don’t loose it. Gary, if you can see your data in Full version, then yes, you can uninstall the free version. Just to be sure, open the Free version, go to More > Backup > Create backup. And then copy the latest zip file from your phone: /sdcard/Android/data/com.mightypocket.grocery/backup. Then it’s safe to Uninstall the Free app. You may want to create backup in Full version as well. Let me know if you have any further questions. After paying for a app you would think the ad banner would stop or am I missing something? Kindly note that you can remove info banners on home screen by long-tapping banner rectangle and choosing “Dismiss all”. Hopefully this helps. This is plucking my nerves. I shop at: Trader Joes, Whole Foods, Shoprite, Acme & certain specialty stores (fish, meat market, hardware store, etc). Can you list individual stores? How? Hi Deidre, thank you for your question. You can create multiple shopping lists under All lists page. Just give list a store name and use it as store’s shopping list. 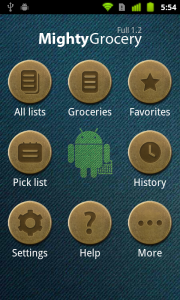 Please see Manage shopping lists User’s Guide for more details. Some items do not scan well. Suggest that you add the ability to enter barcode numbers manually . Hi Richard, thank you for your suggestion. We will consider adding ability to enter barcode numbers manually going forward. I have a list, named after the store I frequent, that contains every item I might ever buy there. When I here ready to go to that store I want a list of just the things I plan to buy, so logic suggests that I would pick items from my store list to create my shopping list. I don’t see a way to do that. I can create a new list but it doesn’t seem to be populated with items from my store list (with scanned info, etc). Hi Lee, thanks for your question. Kindly note that Favorites feature allows you create items that you buy often and add items to your shopping list with a single click. You may also want to have a look at List-specific favorites which allow creating favorite lists by store. Wondering if their is a way to sync with other store apps. Or push items from their app to Mighty Grocery like the Kroger app when you look at the weekly ad just click on an item an push to your list. Hi Steve, thanks for your question. Unfortunately, there is no way to integrate with other apps yet. We may consider this feature going forward if we find apps capable of such integration. I have paid app, every time I scan an item it never shows the price. Is there something I nead to do to get this to work? Kindly note that only a product name is available after you scan a barcode in Mighty Grocery unless you’ve added price information to the product after scanning. Please see Barcode scans User’s Guide for more details.